Two broods: late April to early July, and July through September. Deciduous woods, woodland edges, river valleys, swamps, parks, suburbs. 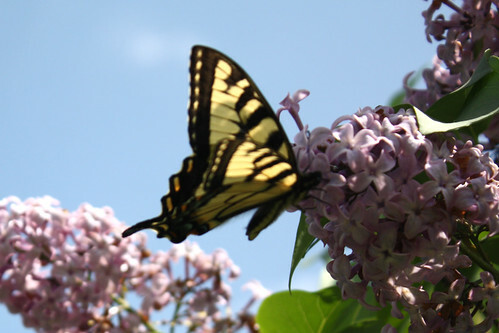 This is a large, familiar, swallowtail butterfly. It has a wingspan of 3½″ to 5½″. The upperside of the forewing is yellow with four black “tiger” stripes and a wide black border with small yellow spots. The upperside hindwing is yellow with one black stripe that appears as a continuation of the innermost forewing stripe and a thin black border along the inner margin, next to the body. A wide black border on the outer margin is broken by a marginal band of 5 yellow, crescent-shaped spots and a submarginal band of 2 to 5 iridescent blue, crescent-shaped spots. The amount of blue in the submarginal band is variable. There is a bright orange spot on the inner margin at the rear of the hindwing, and a smaller bright orange spot at the beginning and end of the marginal band of yellow spots. The yellow band, just inside the wide black border of both wings, is continuous, not broken up by conspicuous black veins. The hindwings have “tails”. 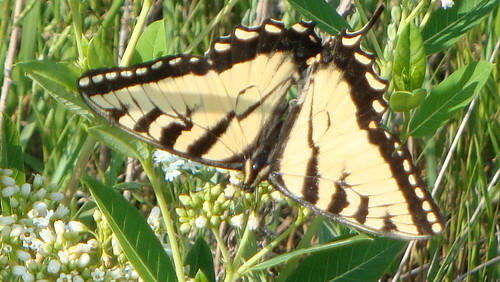 The underside of the forewing is paler yellow with black stripes. There is a wide black border with a marginal band of disconnected yellow spots. The underside of the hindwing is yellow with a central black stripe. There is a wide black border with an marginal row of yellow-and-orange spots and an submarginal row of blue spots. Females have two forms. The yellow form female is similar to the male but with much more blue scaling in the black border. The black form female has black forewings and blue-tinged black hindwings. The hindwings have more blue scaling. The blue on the wings is not iridescent. Black form females are common in the south, uncommon in Minnesota. The caterpillar is green and smooth, with no spines or hairs. There are small eye-like spots on the third thoracic segment with a black and white pupil. 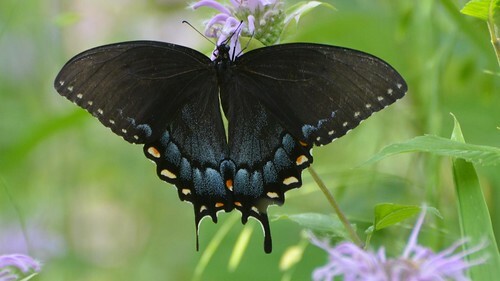 Black swallowtail (Papilio polyxenes) has 2 rows of yellow spots across both wings and a yellow subapical spot on the forewing. Canadian tiger swallowtail (Papilio canadensis) is smaller and less yellow above. The black border along the inner margin of the wing is much wider. The marginal band of yellow spots on the underside of the forewing is continuous, not broken into spots. It is found in the northern half of the state. Black cherry, chokecherry, American basswood), birch, ash, poplar, plains cottonwood, mountain ash, and willow. Flower nectar of black cherry, blazing star, ironweed, joe-pye weed, lilac, milkweed, orange hawkweed, phlox, red clover, thistle, and wild bergamot. Males emerge in the spring shortly before the females. The congregate, often in large groups, at mud puddles where they replenish moisture and minerals lost during metamorphosis. Individuals overwinter as a chrysalis. Distribution Sources: 7, 20, 21, 24, 29, 30, 71. I have seen this type for the last week or so in Bloomington, MN. Taken this morning near St. Wendel, MN. Loving the lilacs on a gorgeous June evening! Male Eastern Tiger Swallowtail. This guy flitted by while I was at my favorite spot today. I got about 50 shots, thanks to the nice multi-shot capabilities of my camera. 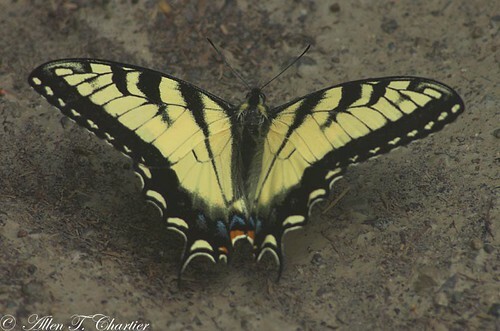 While out on a day scout Krik wandered upon a bunch of Eastern Tiger Swallowtail butterflies frolicking next to a spring fed creek in south central Pennsylvania. I was out walking in the countryside and spotted this butterfly on the side of the road, managed to capture a minute with my camcorder. It was spotted in southeastern Quebec, Canada about 20 miles from the border with New Hampshire. I found, 2 weeks ago, 11 Eastern Tiger Swallowtail caterpillars in my garden on the parsley. I bought a large net enclosure for them thinking with the cold weather they would die due to their size. They are now all in the chrysalis stage and I was wondered if I did the right thing by bringing them inside. I read on your website they overwinter in the chrysalis stage. Should I put them in the garage where it is cooler so they overwinter as opposed to the warmth of inside where they might open earlier with no warm weather outside to release them when ready? I appreciate any advice you can give so they can survive. What is the temperature in which they can be released? 1st one i've seen in this area. While kayaking, I came across about 30 of these together on a small sandy area near the lake shore. They were mostly sitting on the ground and flying short distances. I wonder if they had just hatched. Location: In my garden on an evergreen tree in Roseville, MN. I found this one in the grass this morning, running up and down blades of grass. A first sighting for me. about 9:00 a.m. I saw a pair feeding on Cone Flowers in my alley.